Your Milton air quality testing experts are standing by! With a team of certified and accredited professionals, Air Quality Solutions has become an the authority in indoor air quality testing in Milton and the Halton Region. We are dedicated to helping our residential and commercial customers breathe a little easier by knowing their indoor environment is safe, healthy, and free from harmful airborne contaminants. There are many indoor pollutants that could be present within your Milton home or business that may be impacting your productivity and quality of life. As industry leaders, we know safe air, and will work with you to uncover any hidden pollutants to help protect your health and well being. The certified and experience team of air quality testing professionals at Air Quality Solutions want to help you attain the peace of mind that comes from knowledge. 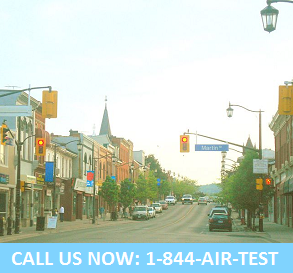 Call today, and speak with one of our Milton air quality testing certified consultants. Help protect your Milton home or business from harmful airborne contaminants. Call your local Milton air quality testing specialists at Air Quality Solutions and start on the path to breathe safe and healthy air!